Hi friends! It's Lisa with you on Day EIGHT of this wonderful 12 Tags of Christmas with a Feminine Twist. I'm so excited that the phenomenal Jill Foster from Penny Black Inc. is back and she and I will be using a sketch that I created just for you today. I hope that you'll be inspired by it and find news ways to turn this sketch around. Put your Santa Hats on and just Have FUN! Now remember, you can turn this sketch around anyway you want to, but keep the main components of the sketch in place (meaning that there is a sentiment, a place for your image, stripes, background with embellishments, etc). 1. First, create the background for the tag using a variety of Distress Oxide Inks and a foam Ink Blending Tool. 2. Using the Kuretake Gansai Tambi Pearl Watercolors, a few of the colors were lightly painted and allowed to drip (and air dry) for a pearlescent watercolor effect. 3. A light spritz of water was sprayed into my hand, flicked onto the tag, and then picked up with a clean paper towel. This is what reveals the "dots" on the paper. 5. After stencil has been lifted. Pretty, isn't it? 6. Cut strips of paper for "stripes" in varying sizes. Put aside. 8. Place mask over stamped image (Penny Black, Gather Round) and use Distress Inks to create soft background. (Colors used were Tumbled Glass and Broken China.) Remove mask and color the image. I used the Zig Clean Color Real Brush Markers to do a loose watercolor of my kitty. In the image above you can see how soft the background is from doing the mask. Ranger's Glossy Accents were used for the eyes, nose, and ornaments. The snowflakes are from Pretty Pink Posh. 10. Die cut the word "Merry" from white Glitter paper and put aside. Isn't it gorgeous? 11. Now stamp the sentiment "Merry Christmas" from the Essentials by Ellen Clear Stamps Modern Christmas by Julie Ebersole onto Lollipop cardstock using Versamark. Sprinkle with White embossing powder and heat set. Cut into banner shape and set aside. 12. Once banner is created. Add thin foam squares to the back for dimension. We are pleased as punch that our friend Jill Foster is joining us again for the 12 Tags! The things that Jill can create with paper & ink always WOW us! And today is certainly no exception!!! Make sure to check out Studio Sessions, the blog Jill shares with her equally talented friend Elizabeth Allan, for more of Jill's exquisite work! Thank you for joining us once again this year for the eighth day of our 12 Tags of Christmas with a Feminine Twist series! Simply leave your appreciation for the beautiful tags of today's dynamic duo, Lisa and Jill, and you will be eligible for the random drawing of the $25 gift certificate to our store www.ellenhutson.com. Leave your comment here before noon on December 18th to be included (one comment per person please.) Be certain to return tomorrow to see what our next team will have to inspire you! Welcome to Day 6 of the annual 12 Tags of Christmas with a Feminine Twist 2016! It's Lisa here with you today and my VERY special and extraordinarily talented guest is the fabulous Jill Foster of Penny Black fame. (YAY!!) Our tags today will be featuring the fun color scheme below and Penny Black products. Let me show you the tag that I created for today's festivities using the Penny Black Cling Stamp, Frosty Day. I used a variety of Distress Inks a smooshed them directly onto my work surface. Then I spritzed them with water and pressed my watercolor paper into the inks. I did this repeatedly until I achieved the color I desired. Once the paper was dry I stamped it with the Penny Black Stamp using Versamark Ink then heat embossed using clear embossing powder. I went over the clear embossing powder with the dark colors of the original Distress Inks (Hickory Smoke, Seedless Preserves) to make the tree really stand out. Then, to give the appearance of snowflakes I flicked Gesso over the whole area using a paintbrush. I die-cut "Peace" and some snowflakes from white glitter paper. and using black glitter tape I bordered the tag and also cut the hole for the tag. Adding the embellishments is the final step. The Taylored Expressions Sequins - Build A Scene, Christmas have beautiful snowflake sequins! Looping some Avery Elle Baker's Twine through the hole at the top makes the tag extra cute, especially if you add a Tim Holtz Jingle Brad (I'm slightly addicted to these.). I know you all fell in love with Jill's amazing tag today and I hope you enjoyed mine, too. This color palette is so fresh and unpredictable for the holidays, don't you think? I just LOVE it!! I hope you'll be using it on your projects, too. We LOVE Jill's bright & colorful style and we are delighted to have her back in The CLASSroom today! Jill is a rockstar designer for Penny Black Stamps and we love when she visits The CLASSroom to share her immense talent! Make sure to pop over the Studio Sessions, the blog Jill shares with her friend Elizabeth Allan. You will find more of Jill's amazing work and Elizabeth's too! Thank you for joining us once again this year for the sixth day of our 12 Tags of Christmas with a Feminine Twist series! Simply leave your appreciation for the beautiful tags of today's dynamic duo, Lisa and Jill, and you will be eligible for the random drawing of the $25 gift certificate to our store www.ellenhutson.com. Leave your comment before noon on December 17th to be included (one comment per person please.) Be certain to return tomorrow to see what our next team will have to inspire you! Hi everyone! It's Lisa with you today and welcome to a VERY special #TexturalTuesdays!! I'm beyond excited to have one of the most talented ladies in the biz here in The CLASSroom with me today to share her beautiful work with us today. My prompt for all of you is to show non-traditional colors with texture. (You all know how I love my texture!) And Jill Foster ROCKs both! First, I adhered a piece of watercolor paper directly to the manila tag and cut it to size. This way I have the perfect surface for a watercolor tag! I am using the Kuretake Gansai Tambi Watercolors to color my background and also the Inkadinkado Stamping Mask Paper to mask off my images (which I die cut) for placement. It kinda looks weird at this point, doesn't it? I love that!! Next lay your stencil over the entire piece, tack it down with low-tack tape (if possible), and using a palette knife spread Texture Luxe™ in Pearl through the stencil. (I reuse these paper stencils until they die, as you can tell.) Pull the stencil straight up. Then carefully peel up your masks and allow the Texture Luxe™ to dry. Next, stamp the Mondo Poinsettia (large - one time, small - twice) using Versafine Onyx Black Ink and heat set with Clear Embossing Powder on watercolor paper. Color the images with Art GRIP Aquarelle Watercolor Pencils in Neutrals and Reds (I used black, grey, and silver for the leaves and a deep red for the center). Die-cut the Mondo Poinsettia flowers with the coordinating die. Embellish the flower centers with Ranger Enamel Accents in Black. Blend the watercoloring further with the Zig Wink of Stella Glitter Brush Tip Marker in Clear. I also die cut the word "Joy" (Love and Joy - Penny Black) 3 times from Bazzill Card Shoppe Licorice Twist and 2 times from Neenah Classic Crest Solar White Heavy Weight Cardstock 110# and adhered them all together, but slightly offset. Before adhering the flowers in place place plenty of Scrapbook Adhesives 3D foam squares on the back for dimension. And die cut some of the Berry Leaves from the Leaves Penny Black Die and tuck behind the large Poinsettia before adhering. We're always dazzled by Jill's fabulous creations - in fact, we are just tickled pink (and yellow and blue and purple) to be able to share Jill's non-traditional colors and textures tag with you! Jill showcases Penny Black's stamps and dies to help us think outside of our creative box. You can find so much inspiration using the Penny Black stamps, dies and stencils on the blog she shares with Elizabeth - be certain to check out Studio Sessions and be inspired! Thank you so much Jill! It's adorable! Dreamweaver Embossing Paste, Pearlescent, 4 oz. Thank you for joining us once again this year for Day 8 of our 12 Tags of Christmas with a Feminine Twist series! We would love it if you would leave a comment below sharing your appreciation for Lisa's and Jill's beautiful tags here today and you will be eligible for the random drawing of the $25 gift certificate to our store www.ellenhutson.com. Leave your comment before noon on December 13th to be included (one comment per person please.) Be certain to return tomorrow to for some Christmas tag inspiration using Avery Elle stamps! Hi everyone and Happy Tuesday! You know what THAT means!! Yep..that means it's Lisa here with you for another edition of #TexturalTuesday!! So, let me talk to you a little about what Gel Medium is and isn't. There is a little bit of confusion out there in crafty-land about this stuff and it's my job to clear the air, right? Right! Here we goooo: "The primary function of Gel Medium is to broaden the technical capabilities and results of acrylic paints. Depending upon the type of medium employed, it can alter the consistency of paint, add sheen, reduce gloss, adhere mixed media elements to the surface of the painting, increase film integrity, add a transparent coat, reduce the cost of paint, prime a canvas, repair a painting, protect a painting and bind paint. Artists use gloss medium to highlight specific elements of a painting, such as the breaks of waves or the edges of clouds. Gel medium also works great in collage, decoupage and transfers." Just like with my last #TexturalTuesdays blog post here in the CLASSroom on Gesso, I'm going to show you how to use Gel Medium in a variety of ways. For the canvas above I used the super versatile Essentials by Ellen Designer Dies, Be-YOU-Tiful by Julie Ebersole as my sentiment. 1. To start I have a 9" x 12" very basic canvas and a print of a butterfly that I found online, put on a thumb drive and made copies of at my local copy center. The reason for this is that for the Image Transfer Technique you do NOT want to use an ink jet printer. It should be toner based or from a magazine. 3. Using a water bottle, spritz the image completely with a coating of water. You will want to make sure the image is completely damp. At this point you will want to start attempting to remove the paper from the canvas. By rubbing the paper away gently, you will be leaving the image behind...not the paper. 4. As you rub, be gentle, but firm. You DO want the paper to lift. But do not rub too hard. If you are rubbing too hard you may remove your print. You may keep adding additional water, as needed. 5. The best part of the Image Transfer Technique is the imperfections, the slightly distressed look and how unique it will turn out each and every time. At this point I decided to add some tissue paper in random areas. Using the Gel Medium now as collage medium, I applied the Gel Medium first on the canvas, then put the tissue paper down, and then put another coat of Gel Medium on top. Then allowed it to dry. 6. Next, I used "painted" the butterfly with a light coating of Gel Medium. This will allow me to use the Stamper's Big Brush Pens in a very wonderful way! As always with Gel Medium make sure that it's completely dry before going on to another step. 7. I have my 4 chosen colors of Stamper's Big Brush Pens. 2 Blues and 2 Greens. Starting with the Darkest Blue at the center of the Butterfly, the lightest blue, darkest green, then the lightest green I blend them all together. Since there is a base of Gel Medium these will all blend together with either just your finger or a touch of moisture. Either a paintbrush or water brush. If it gets too wet, just dab it up with a paper towel. These will dry permanent, archival and lightfast as they are India Ink. This is how pretty they look all blendy!! 8. I love a little sparkle so I added a little bit of Glass Bead Glitter Gel to the Butterfly wings. I tend to use my fingers, but you use whatever makes you happy to get that stuff on your Butterfly's wings. With this stuff just remember -- less is more. If you use too much? It takes forever to dry and really doesn't look at that pretty. No bueno. 9. So now to fill in the rest of the canvas!! Yay!! So simple! I used TWO Gelatos®. Yup. That's it. Two. I used Squid Ink and Margarita Mix. Started off with the Squid Ink and rubbed it all over the place and then worked in the Margarita Mix on the edges. I hope that you enjoyed learning the Image Transfer Technique and saw how many other wonderful uses Gel Medium has. It's definitely one of the products I use the most. Hope that you had a wonderful Labor Day weekend and enjoy the rest of the week ahead. Ranger Dina Wakley Media Gel Medium, 2 oz. Color is something that has always captured me and when I first saw our guest designer's work I hoped that I would one day have the honor of meeting her. That wish came true at this year's Winter CHA. Elizabeth Allan was working in the Penny Black booth when we stopped by and I was giddy with excitement when Elizabeth said yes to my invitation to share her creativity here in the CLASSroom! You can find more of Elizabeth's fabulous work at the blog that she shares with Jill Foster titled Studio Sessions. Elizabeth talent showcases the Penny Black and Inchie Arts products for whom she designs in an absolutely fabulous way! I know that you will be inspired when you visit their blog! Please join me in thanking Elizabeth for sharing this fabulous Art Book by heading over to her blog Studio Sessions. Simply leave a comment on the post showing the package of goodies shown below - these goodies are our way of thanking you for taking the time to visit and explore Elizabeth's blog. Please leave a comment on her blog post about being a guest here by March 19th to be included in the random drawing hosted there. Hello everyone! It’s an honor to be today’s guest designer in Ellen’s CLASSroom. One of my many loves when creating art is to make three-dimensional pieces. So, when Ellen asked if I could stop by for a visit and share some “color”, I immediately thought of creating a small art book. A little something you could use as a personal notebook, tiny scrapbook, mini watercolor/mixed media journal, or a gift for a friend. For an antique flair, I aged the covers to give them the appearance of fabric. Step 1: Stamp Penny Black’s Poppy Pattern in Desert Sand Memento ink on two 4” white Art Squares. Step 2: Lightly color the poppies with Art GRIP Aquarelle Watercolor Pencils. Applying the color in small, round circles will provide an even application and eliminate hard edges when water is applied. This is an easy way to pre-plan color patterns and shading. Step 3: This next step incorporates blending the watercolor pencil applied in the previous step and the application of Koi watercolors. Using a water brush or paintbrush, add the watercolors using the watercolor pencil as a guide. (I use the water brush like a paintbrush and do not fill the water chamber as it gives me more control of the water application.) Keep adding layers of color until the desired intensity is achieved. The background between the flowers was painted in a soft blue. Step 4: This is the part where the Art Squares start to appear as if they have been covered in fabric. When the watercolors have dried, apply a light layer of Desert Sand Memento ink with a jumbo sponge dauber. Step 5: To seal the colors and give the book covers a subtle sheen, apply a coat of Gel Medium. It gives the piece a sumptuous finish as well as added durability. I have the best results using my finger for the application. Step 6: While the book covers are drying, cut a piece of watercolor paper to measure 4 x 12 inches. Score the paper at 4, 4 ½, 5, 5 ½, 6, 6 ½, 7, 7 ½, 8. Fold the pleats as shown. As a visual reference, gluing areas are noted here which will be part of Step 7. Step 7: Stamp the inside front and back panels with Penny Black’s Decadence in Desert Sand Memento ink. Apply the glue (Glossy Accents) to the scored areas indicated in the previous step to form the pleats. Step 8: Cut 4 pieces of watercolor paper to measure 4 x 8. Score each panel in half. Glue the panels to the pleats. (Tip/Hint: Dry fit the panels on the pleats to see that they do not overhang the covers. The panels may need to be trimmed slightly.) Ink the edges of the Art Square covers with a black (110) Copic marker. Glue the front and back panels of the booklet to the covers. Thank you for joining me the CLASSroom. Wishing you a day filled with colorful, dimensional happiness! Good Wednesday morning and welcome to the CLASSroom. My project today is a simple thank you card with a surprise inside made using Julie’s new Diagonal Window die, a sentiment from her Fancy Thanks set paired with small flowers made using Impression Obsession Bunch of Blossoms and leaves from Julie’s Bold Blooms Matching die set. The frame on the card front is from the Impression Obsession Rectangle 6-in-1 Frames set. Penny Black’s Painted Blooms gingham paper coordinated perfectly with the simple floral paper from the Penny Black Beau Jardin pad. I like the simplicity of the gingham card front with only the white frame and white bow for embellishment. The fun comes when untying the bow and seeing the surprise inside the open window. The card is really a fast and easy card to make. Oh….and lots of fun! Create an interesting base for the inside of your window. Cut the diagonal window using a coordinating paper or cardstock. The die is exactly 5.50” x 4.25 and covers an A2 card front perfectly. Cut the tiny tabs of the window openings with a craft knife or scissors. I liked using my craft knife as it made a perfectly clean and straight cut. Apply mounting tape on the back of the window and apply to the card base. I used mounting tape to create a bit of depth for my sentiment and flowers. The window could be attached flat to the card base if desired. Cut several leaves and flowers. I wanted to create white flowers that matched the flower pattern in the designer paper. Sketch in the flower design using Wild Honey and Pumice Stone distress markers. Lightly wash the colors with a waterbrush to create a watercolor effect. Form the flowers and leaves with a stylus and molding pad. Stamp the sentiment, layer it with coordinating paper and attach flat to the card base with double stick tape. Attach the flowers and leaves to the card base using glossy accents. After I got the whole card put together I thought the yellow gingham front looked a little to plain so I cut the rectangle frame and attached it over the window opening with double stick tape. Fold the window to a closed position and run ribbon through the holes to use to tie them shut. Hold the ribbon securely and tie into a pretty bow. By the way….Julie taught the trick of using tweezers to hold the ribbon tight for tying in one of her video tutorials. I thought it was so smart. I hope you enjoyed my tutorial today and that you may be inspired to create your own surprise window card. I fell in love with this outfit the moment I spied it--not to wear, of course, because she can, being the tall and statuesque goddess that she is. But short & squatty, a.k.a. yours truly?! Nay; no-can-do. I used my beloved Shape N Tape, but you could always swap in some patterned paper of a similar pattern. I think it looks so cool with the partially inset "Happy" die by MFT... Trés chic! Now and then it's good to get back to the basics and enjoy simply stamping techniques. Many times the stamp images in themselves are so beautiful that they really don't need all the extras. Today's card project revisits three simple stamping techniques to create a beautiful floral panel. I love stamping on patterned paper. This card design can also be stamped onto plain cardstock but I really love text papers and this one in particular. It's a lovely text print that is on the angle. No...I didn't put it that way. The print is angled on the original square 6x6 paper. It's from the new Studio Calico line, South of Market and I just can't get enough of it. Using an angled print is great on simple card designs as it provides visual movement in the design without adding additional layers and distractions. Here's a detail image of the stamping. I've used a two-step stamping set by My Favorite Things Stamps called Contemporary Roses. It's a beautiful classic stamp set and seriously, roses never go out of style! Two Step Stamping is a beautiful and simple stamping technique. You need a stamp set that has been designed for it. Basically what it is, is two stamp images that when combined create one single image. In the above image you can see the stamps that go together to create a two step stamped image. The large solid rose is stamped first and then the more open petal accents stamp is stamped overtop of the original image. This adds a lovely dimension and detail to the stamping. Stamping Off is a simple way to get more "color choices" from one ink pad. Yes the color remains the same but you get a lighter version by stamping off. To stamp off an image, simply ink your stamp image in the ink, stamp it off onto some scrap paper and then stamp it without reinking onto your design surface. This is a great way to add some subtle dimension and effects to your project. Double Inking is the final quick stamping technique that I've used in this design. You can see the example above in the leaves. First I inked the entire leaf stamp in a lighter ink (Pear Tart for this project) and then used a darker ink pad (Bamboo Leaves) to come in and lightly brush it across one or more edges of my stamp before actually stamping the image on the paper. I love this look as it really adds a soft almost watercolor look to your stamping. One of the ways I've accented this project is with clear sequins. It's a subtle look that doesn't take away from the stamping. I find Glossy Accents to be a great way to adhere sequins to a project. It holds well and dries fast. Because I use it so much, I like to keep it on my desk with a pin in it. The pin keeps the glossy accents from drying out and also prevents the nozzle from clogging. Thanks for stopping by the CLASSroom! Have a fabulous and creative day! I like to keep an easel in my studio/office with an 8-inch seasonal scrapbook page on it and it was time for a new Spring page! The anchor for my page is this wonderful Penny Black Slapstick/Cling Sweet Dahlia collage image stamp that measures a generous 3.75" square. I stamped it with Memento Tuxedo Black ink onto Neenah Solar White cardstock. I wanted to use the "sweet" sentiment from the collage as a focal point, so I masked around the word with some 3M Post-It Adhesive Roll/Labeling Tape and used Tumbled Glass Distress Marker to ink and stamp the word onto more Neenah Solar White cardstock. The "sweet" sentiment was die cut with Taylored Expressions die frame from the From Me To You Cling Stamp & Die Combo. The edges of the die cut were sponged with Tumbled Glass Distress Ink and an Ink Blending Tool. You could go full out and color the entire image beautifully, but for this project I wanted to keep the image primarily black & white with just subtle washes of Spring color. To finish the page, I cut a piece of floral Hot Pink Shape 'N Tape to add to the bottom of page -- I chose to leave the tape stuck to its white backing paper and just used it like a piece of patterned paper (because, remember -- once the tape is off the backing paper, anything that was showing white will be transparent and have the background color showing thru ... in this case, teal). I did the same for the solid hot pink mat layer behind the smaller photo of my girls, using Lifestyle Crafts Labels Dies to cut the hot pink tape and photo. A piece of Gray Shape 'N Tape was cut .50" x 6.25", taken off the white backing paper and used like washi tape, to help anchor the stamped image and floral paper/tape to the page. I love this dark charcoal color -- it's just a little softer than black but still makes a bold statement. Both the small photo of my girls and the "sweet" sentiment pieces were popped up on my favorite Copic Foam Tape. Copic Color Multiliner 12-pc Set is a fabulous addition to your scrapbooking supplies -- they make great journaling pens, in a multitude of any color you could need! Here, I chose Cool Gray to write the place and date at the bottom of my page. As I mention in the video, this card was inspired by a story on Facebook about a soon-to-be 11 yr. old young man, who has a disability similar to Autism. Unbeknownst to him, his Mom is trying to give him a very special birthday! I love the versatility of this particular design--it can be so easily modified by simply switching color schemes and patterned papers! The fonts featured in the stamp set (Cake & Candles by Avery Elle) are "ageless" and adaptable to either gender, which is a GREAT bonus in any type of greeting set. I also love that the dies in the Uplifting set by Penny Black come in two different sizes so there are plenty of options. Enjoy the video here or on our YouTube Channel and thank you for subscribing! You can switch to 720p for best viewing quality, as well. Color is something that Jill Foster does in a stunningly beautiful way and the tag that she shares with us today is an exceptional example of the bold, intense colors she uses when creating. If you have not found Jill's blog, Inspired By, through previous guest posts she has shared here you will definitely want to visit today! As a designer for Penny Black, Faber-Castell, and Inchie Arts you will find many wonderful examples using these product lines on her blog. For my tag, I’m excited to share a mixed media approach to stamping. Because I’ll be using Gelatos on my tag, I began first by painting it with Gesso. The Gesso creates a non-porous surface which allows for very easy blending of the Gelato color. Once the Gesso was dry, I stamped my image (Penny Black 40-258 Dancing Deers) using VersaMark ink. I sprinkled it with white embossing powder and applied heat to set. I colored my tag using 3 Gelatos from the same color family. I was not worried about perfect coverage, I just colored heavily to get the pigment onto the tag. I blended the color with my fingertips and then “swished” a baby wipe across a few areas to give the tag a painted texture. I also used a baby wipe to remove the excess color from the reindeer. Using a stamp from the same set, I colored onto it with Stamper’s Big Brush Pens and stamped repeatedly onto the background. Finally, using my fingertip, I added randomly added Gesso to the background. *BONUS TIP: To create the look of snow, use the tip of the handle-end of the paintbrush to add dots of Gesso to the background. To finish off my tag I added die cuts (Penny Black 51-015 Snowflake Trio and 51-021 Love & Joy), torn white paper for a snow bank and ribbon custom-colored with Gelatos. I created the ribbon by coloring directly onto it with two colors of Gelatos and then swiping across the ribbon with a baby wipe to blend. Here’s another peek at my tag… I had so much fun creating this mixed media look and can’t wait to try it with lots of different color combos. Please join us in thanking Jill for once again sharing her colorful style with us! 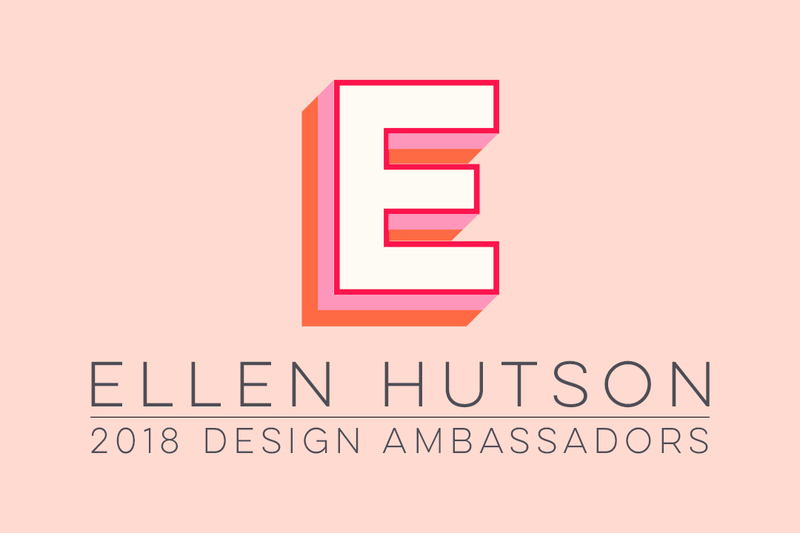 Leave your comment below to be eligible for the random drawing of the $25 gift certificate to our store www.ellenhutson.com - be certain to do so before noon on December 13th to be eligible (one comment per person please.) Join us tomorrow when we debut a new tag designed by Heather Campbell! Hello and happy Fall! I'm excited to be back in the CLASSroom today after my family's move further south in my home state of Texas. At least in some parts of the country I hear Fall is starting to make an appearance -- down here in the southern coastal part of the U.S. I think it's still quite a way off (which is fine by me)! Nevertheless, it's my favorite time of year -- I love the crisp mornings and the deep, rich colors of Fall, so I wanted to challenge myself to try and get some extended versatility from what may be considered more Spring/Summer stamp images -- like these pretty ones from Penny Black's release earlier this year that I hadn't had a chance to ink up yet! 3 - After airbrushing, pounce and rub Inkadinkado's Embossing Magic Bag (shown on the right) all over the area to be embossed. The airbrushed markers can sometimes leave the paper surface feeling a little "tacky" and the bag will be sure to remove that tackiness so the embossing powder will only cling to the intended stamp image. On the left in the photo above, I've already stamped Penny Black's Clear Lace Trims stamps (I just left them on the clear storage sheet) with Distress Embossing Ink and covered the images with Ranger Seafoam White Embossing Powder. Next, I stamped Penny Black's Cling Garden Assistant with Memento Rich Cocoa ink onto Neenah Cream cardstock and colored her with these Copic Sketch markers: E00 & E11 (skin); YR21 & E23 (hair & flowers); YG93, YG95, YG97, YR65 and YR68 (floral patterns), E25 & E27 (hats). She was hand trimmed and popped up on Copic Foam Tape. As I've suggested before -- if calendars are not your thing, you can use this same project idea as a scrap page (I finally remembered to snap a photo before adhering Ellen's 2013 Ring Binder Calendar PDF Download!). I printed the calendar on Neenah Natural White cardstock at 80%, which yields an approximate 3.25" x 3" calendar. 8 - The calendar was finished with Ellen's Iridescent Pool and Iridescent Melon Essentials Sequins. Here are the supplies I chose for our family album this year. Since I have 2 girls, I went with the Blush Edition Core Kit . . . I think there is still enough blue, green and gray in the mix for more masculine pages, to suit my husband! This kit is larger than it appears here -- the box measures approximately 10.50" x 11.50"! All the colors coordinate beautifully, with a mix of 4x6 and 3x4 cards -- just perfect for my Big Pack (60 ct) of 12x12 Page Protectors! This is a great starter pack to try, if you aren't sure yet which orientation of page protectors you might use most often ... it contains a mix. For the year title, I stamped this pretty new Penny Black Slapstick Cling-Ornately Framed with Memento Gray Flannel ink onto Neenah Solar White cardstock and then hand trimmed around the outside edges. To create a chalkboard look, I colored the inside of the frame with Copic N4 Sketch marker. To coordinate with all the colors of the PL cards I chose, I used Copic Sketch markers BG13, Y21, BG05, and R83 to color some American Crafts Foam Thickers Shoebox White numbers, then adhered them to the center of my faux chalkboard. The photo of our family I used for this title page is a collage I created with a phone app and then printed in 4x4 square format. I adhered it to a green 4x6 Textured Blush Edition Cardstock -- this card pack also coordinates wonderfully with all the colors of the Blush kit! I thought this was a versatile size, because they can be used to mat photos in the 4x6 slots, or cut in half and also used in the 3x4 slots. Now I just have to choose the album style I would like to display this year's photos in! Project Life makes it quick and easy to get all your photos into archival-safe albums, quickly and easily, so they can be enjoyed and treasured for a lifetime . . . I'm SO happy I finally tried it and that Ellen is carrying all the supplies! We are thrilled to welcome back Jill Foster! Jill's color sense is amazing incredible and we are so excited that she is sharing some "how-to's" with us today as she showcases on of the brand new Penny Black images we just received in. Using Inchie Arts Twinchies art board as a canvas and Faber Castell art supplies she creates cards with mesmerizing colors! I would like to once again share Jill's blog, Inspired By. She designs for Penny Black Stamps, Faber-Castell's Design Memory Craft and Inchie Arts - so you will find loads of ideas on how to use these products there! We would appreciate if you would help us thank Jill for sharing her talents with us here in the CLASSrooom. Please leave your comment on Jill's blog on her post about being a guest here. As our way of thanking you for taking the time to do so you will have a chance to win some of the fabulous products she used in this post! You know you are in the right place if you see the following picture. I am so excited and honored to be sharing a set of cards created with three of my favorite, go-to products: Penny Black stamps, Inchie Arts matboard squares, and Faber-Castell Design Memory Craft coloring mediums. And my favorite part is that they all work so well together! To begin, I started with an Inchie Arts Twinchie Square and stamped it with Penny Black 40-238 Floral Applique. I love to stamp larger images on the mat board squares so that only parts of the image peek out on the small squares. It gives the image a whole new look! Next color the image using Faber-Castell Design Memory Craft Art Grip Aquarelles. No need to take too much time, scribble coloring works great for this step. Once you’ve laid down your color, blend it using water and a paint brush. It instantly turns to paint, and, because I’m working on a strong matboard square, there is no warping no matter how much water I apply. Next, add a touch of color to the edge by coloring with a Gelato onto the edges of the Twinchie and then blending with your fingertip. To create a soft background, begin by coloring directly onto your stamp with a Faber-Castell Stamper’s Big Brush Pen. Huff (breath) onto the stamp and then firmly press it onto white cardstock. Now color on to the stamped image with Gesso (you can use your fingers if you want to get messy or use a paintbrush). Apply the Gesso unevenly, allowing some layers to have a thicker application and some a very light application. Once dry, color on top with Gelatos and blend with your fingertip. For a white-washed look I used a Coconut Gelato. If you want a bright background, follow these same steps but substitute a colored Gelato for the Coconut one. I hope you have a fantastic and creative day and that I’ve inspired you to give a few of my favorite supplies a try. Happy stamping!